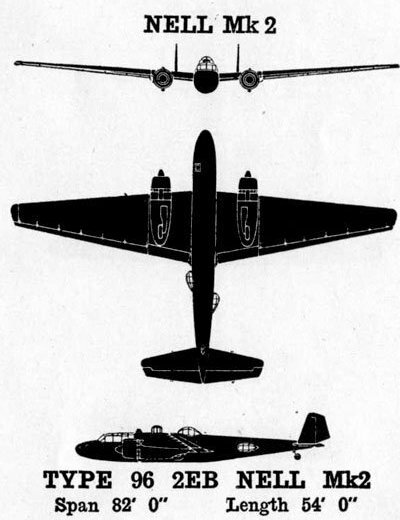 Mitsubishi G3M2 Model 22 "Nell"
Dimensions 82'0" by 54'0" by 12'1"
Power plant Two 1075 hp (802 kW) Mitsubishi Kinsei 41 or 42 fourteen-cylinder air-cooled radial engines driving three-blade variable-pitch metal propellers. One flexible 7.7 mm Type 92 machine-gun in each of the lateral blisters and a retractable dorsal turret. One flexible 7.7 mm Type 92 machine-gun fired from cockpit windows. One 800 kg (1760 lb) torpedo or 800 kg (1760 lbs) of bombs carried externally under the fuselage. Variants The G3M1 used two 910 hp (678 kW) Kinsei 3 engines. The G3M3 used two 1300 hp (969 kW) Kinsei 51 engines and added another 20mm Type 99 cannon in a dorsal fairing and three more 7.7mm machine guns in side blisters. Fuel capacity was increased to 1140 gallons (5182) giving a range of 3871 miles or 6229 km. Also known as the Type 96 Land-based Attack Aircraft, "Nell" was designed in response to a Navy call for an attack aircraft with the range and performance of the G1M1 reconnaissance aircraft, which had created a sensation in Navy circles. The first prototype flew in April 1934 and the design was adopted by the Navy in June 1936. It was dubbed the chūkō, a contraction of chūgata kōgeki-ki ("medium attack plane"). Adoption of the aircraft required rapid expansion of aircrew training, since the aircraft was more manpower-intensive than any previous Navy aircraft. Crews were initially selected from the elite of the existing carrier air groups. Because of its speed, the crews believed that no fighter could touch them, until experience over China proved otherwise. The defensive armament was inadequate, the aircraft lacked any kind of armor protection, and its vulnerable fuel tanks caught fire almost any time the aircraft was hit. The Nell was being replaced by the G4M "Betty" as the Japanese Navy’s principal long-range land-based bomber at the time of Pearl Harbor. Force Z from Singapore (Prince of Wales and Repulse) were sunk by torpedoes from Nells and a few Bettys in the Gulf of Siam just days after the Pearl Harbor attack. A number of Nells were equipped with radar or magnetic anomaly detectors late in the war for convoy protection. In spite of its medium bomber layout, the Nell had no internal bomb bay, being designed to carry a single torpedo under its belly instead. It featured retractable turrets, though these were reduced from two dorsal and one ventral turret in earlier models to a single retractable dorsal turret in the Model 22.